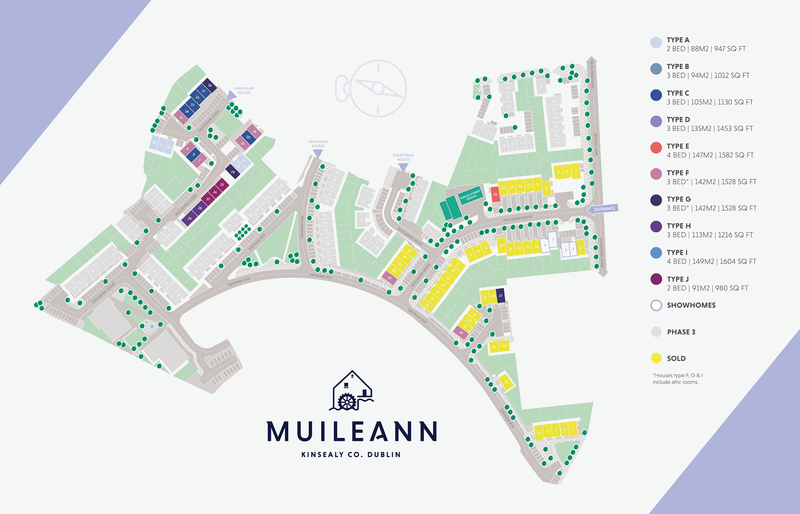 Taking its name from the Irish word for 'mill', Muileann is ideally situated in Kinsealy, between Swords and Malahide, and benefits from the host of amenities on offer in what are some of the most sought-after neighbourhoods in north Dublin. It is less than five minutes' drive from both Malahide Castle and the Pavilions Shopping Centre, and also close to Dublin Airport and Airside Retail Park. The villages of Malahide and Portmarnock to the east of the development are ideally suited for a leisurely stroll and dinner. Muileann is ideally situated between beautiful Malahide and Swords for all types of social occasions. For a great day out, head to the charming fishing village of Howth for a walk along the cliffs followed by dinner in one of the many excellent restaurants. SHOPS, BARS & RESTAURANTS ALL ON YOUR DOORSTEP.